Vintage from Paul is pleased to offer these simply marvelous Tienshan Folkcraft Holiday Pines Tree Dessert Plates. 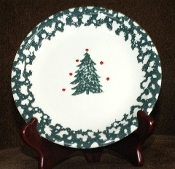 This pattern features a green sponged design set against a creamy background and as the focal point, in the center of the plate is a green sponge tree accented with red berries. Each of the available Tienshan Folkcraft Holiday Pines Tree Dessert Plate is in MINT Condition with no chips, cracks, scratches, or other defects/flaws. The colors are vibrant, the graphics crisp. The Tienshan Folkcraft Holiday Pines Tree Dessert Plates measure 7-5/8 inches in diameter.